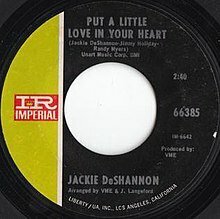 "Put a Little Love in Your Heart" is a song originally performed in 1969 by Jackie DeShannon, who composed it with her brother Randy Myers and Jimmy Holiday. In the U.S., it was DeShannon's highest-charting hit, reaching number 4 on the Hot 100 in August 1969 and number 2 on the Adult Contemporary charts. In late 1969, the song reached number one on South Africa's hit parade. The song is used in the Gus Van Sant film Drugstore Cowboy. "Put a Little Love in Your Heart"
(1969) "Put a Little Love in Your Heart"
(1969) "Love Will Find a Way"
The song rivaled the success of her signature song, "What the World Needs Now Is Love". (1987) "Put a Little Love in Your Heart"
(1988) "As Long as We're Together"
In 1988, Annie Lennox and Al Green recorded a version that was released as the ending theme song to the 1988 film Scrooged. The song reached number 9 in the US on the Hot 100 in January 1989 and climbed all the way to number 2 on the US Adult Contemporary chart, as well as becoming a top 40 hit in several countries worldwide. Although credited to Lennox, the song was produced by her Eurythmics partner David A. Stewart. The video was directed by Sophie Muller. Susan Raye covered the song on her debut 1969 album, One Night Stand. The song was released as a single and peaked at number 30 on the Billboard Hot Country Songs chart. The Dave Clark Five recorded a version in 1969. Issued as a single in the UK, it spent four weeks in the top 75, reaching number 31, three positions below that attained by Annie Lennox and Al Green in 1988. David Ruffin formerly of The Temptations recorded a version as well on his sophomore solo album Feeling Good in 1969. Siw Malmkvist made a Swedish version in 1970, Pröva lite kärlek nå'n gång with lyrics by the wellknown Swedish journalist and songwriter Peter Himmelstrand. Malmkvist's version appeared on her album Underbara Siw (Wonderful Siw), which was awarded a Swedish Grammis the same year. The Isley Brothers recorded their own version on 1972's Brother, Brother, Brother album. Circle Jerks Tongue-in-cheek version appeared as the final track on their 1982 album Wild in the Streets. At the end of Richard Donner's film Scrooged (1988), Bill Murray breaks the fourth wall to lead a sing-along of the song. Dolly Parton included a gospel-inspired version of the song on her Slow Dancing with the Moon album in 1993. ^ Whitburn, Joel (2002). Top Adult Contemporary: 1961–2001. Record Research. p. 77. ^ Brennan, Steve (June 11, 2015). "15 Best Songs From '80s Movies (Besides "The Power of Love")". browardpalmbeach.com. Retrieved November 15, 2017. ^ "Top Singles - Volume 51, No. 8, December 23, 1989". RPM. December 23, 1999. Archived from the original on September 7, 2017. Retrieved November 22, 2017. ^ "Hollywood Flashback: When Bill Murray Played a Sleazy Lounge Singer on 'Saturday Night Live'". hollywoodreporter.com. Retrieved November 15, 2017. ^ "The Short, Strange Music Career Of Leonard Nimoy". Stereogum.com. March 2, 2015. Retrieved October 14, 2018. ^ "Cinematography III : Merry Christmas, You Filthy Animal, by Bright Light Bright Light". Bright Light Bright Light. Retrieved 2018-12-03.